Vinnie’s Steak House & Tavern’s website has a NEW look! Use the link below to check it out and let us know what you think. Take caution, photos may cause extreme desire for a night out at Vinnie’s. As the cold weather returns, remember Vinnie’s has plenty of great dishes to keep you and your loved ones warm! This week we are proud to showcase more of our favorite winter dishes. Start your meal with one of your local favorites, Chef Tom’s famous Baked NC Oysters with Bacon, Collards and Brie. You can find out more about one of Chef Tom’s favorite dishes in the latest issue of Wake Living. Enjoy our tasty Collard Greens as a supplement to your meal…this southern classic is sure to be a wonderful addition to any entree. Later this week, from our friends at Locals Seafood we’ll have NC Snowy Grouper for you to enjoy. Call or stop by to see how Chef Tom will be preparing this hearty fish. our beautiful and sophisticated Blood Orange Semifreddo with a Chocolate Spice Cake, Chocolate Bark, Pistachio Brittle , Candied Blood Orange Zest and a Blood Orange Reduction. Vinnie’s Steak House and Tavern is pleased to announce our involvement in this year’s Triangle Wine Experience to benefit the children of Frankie Lemmon School & Developmental Center, January 31st- February 2nd. Click the link below to view all participating locations and events. 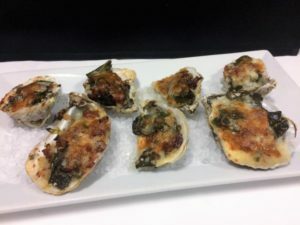 Headlining our featured list this week are our heavenly NC Baked Oysters loaded up with Bacon, Collards and Brie and baked until golden-brown delicious. 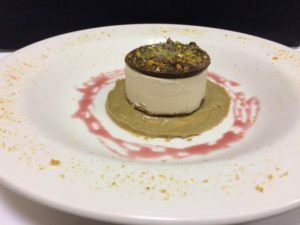 Blood Orange Semifreddo layered between a decadent Chocolate Spice Cake and topped with a crunchy Chocolate Shell, the Semifreddo is perfectly paired with Pistachio Brittle, Candied Blood Orange Zest and a Blood Orange Reduction. Copyright © 2019 VinniesSteakhouse.com | All Rights Reserved.